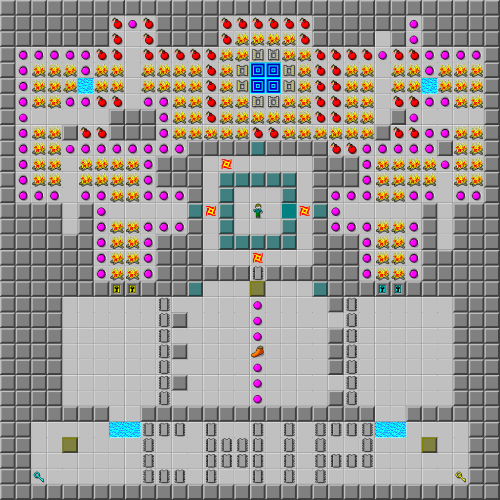 Balls O Fire - The Chip's Challenge Wiki - The Chip's Challenge Database that anyone can edit! Balls O Fire is the 107th level in Chip's Challenge 1. Continuing the trend of symmetrical levels, Balls O Fire's only anomalies are slightly different paths to the exit and some slightly different walls, monsters, and a different color of key, plus a bit of a surprise at the bottom. Play 3R to escape the blue walls, then take the fire boots by playing the block onto and off them, and then run to collect the chips on the right. As can be seen below Chip at this point, the lower section contains a bunch of chips, two keys, and two blocks. The block currently in the center must be used to reach this area; push this 5L, take the lowest five chips, and then move the block into the water to reach the "CHIP"s. Collect about half of them on the way to the right, take the yellow key, and then the rest of them, and play the block near the blue key 4R 9U. 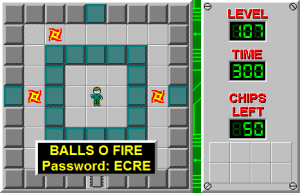 Open the yellow lock on the left, which will allow Chip to shove the block through the maze until he reaches a bomb, with the exit behind him.